Ten year after his investigation almost ousted Bill Clinton from the White House Kenneth Starr talks about law and Christianity, his time in 1968 and why he doesn't want to write a memoir. Kenneth Starr [speaking to his assistant]: Can you bring me a bottle of water? You’re not getting a coffee from Starbuck’s? Starr: I’ve had my Starbuck’s, but I just finished. So, it’s true that you’re addicted to Starbucks. How many cups a day do you have? Starr: Actually, I try only to have one. But I do drink a lot of coffee at home. You have it black or with milk? You’re a religious man. Are there any other vices you have? Starr: Many. Many vices, which I don’t discuss. Are we on the record? 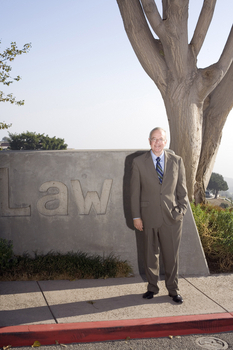 You’re the Dean of Pepperdine University, a Christian law school. What has Jesus to do with the law? Starr: Well, we’re called to serve, and one of the purposes of Pepperdine as a university is to encourage our young people to develop skills and talents so that they can lead truly meaningful lives of purpose, service and leadership. It also means to be a Christian institution, be a very hospitable institution. We take the parables of the Good Samaritan very seriously. So welcome to our university. Thank you. Here, law students learn about Jesus. What Christian values does a lawyer need to bring into the courtroom? Starr: A genuine sense of compassion, a sense that each individual involved in the process, including one’s opponents, is a person of inestimable worth, and must be treated with the utmost dignity and respect. In your welcome note you write that lawyers need to be the instrument of the Lord’s peace. Don’t they need to defend the American Constitution? Starr: Well, the two are not inconsistent, because you can in fact be an instrument of peace while defending our constitutional order. The United States has a strong separation between Church and State. Not everybody follows the teachings of Jesus. Starr: Abraham Lincoln was one of our great lawyers as well as the 16th president of the United States. He encouraged his fellow lawyers to be peacemakers. I don’t think he was overtly articulating a Christian perspective, but from a Christian perspective in the Beatitudes, blessed are the peacemakers. And so from the very outset of the law school, peacemaking is a school for lawyers. You had a strong Christian upbringing and studied the Bible closely. What made you go to Law School and not becoming priest? Starr: The scriptures are filled with admonitions about justice, mercy, and excellence. The cry for justice is a very powerful theme throughout Scripture. But also, beyond justice, is the value of forgiveness. And that I believe is in the Christian perspective, and it translates into the law. If you call lawyers peacemakers, do we need them to mediate the big international conflicts? Starr: We’re increasingly involved in international and global issues. Including encouraging peacemaking in sub-Saharan Africa, one of our leaders of the Strauss Institute spends time in sub-Saharan Africa, with the enduring problem of tribalism and tribal warfare and so forth. I have personally been involved in a Muslim-Christian dialogue, which has been very promising. The American political scientist Samuel Phillips Huntington calls the conflict between the Christian and the Muslim nations a «clash of civilization». Is he right? Starr: I hope not. Many passages in the Koran that are preached from mosques are about peace, and the evil of taking of life. I think Islam does contemplate just war, the way Catholic theology does and a lot of Protestant theology contemplates the idea of just war. Of course the idea of the targeting of civilian populations is so anathema to widely shared norms. Can the conflict between Christians and Muslims be solved? Starr: I’m optimistic, given my friendships over the years and my travels in the Muslim world. I believe that radical Islam is in the minority. American Christian’s want to hang the Ten Commandments in public buildings. Where do you stand? Starr: Well, the Ten Commandments are in fact foundational, and are viewed as the root of much of law. When we think of a lot of simply positive law, they tend to reflect the values that are articulated in the Ten Commandments. Only three of the Ten Commandments – you shall not kill, you shall not steal and you shall not bear false witness – are actual law. Starr: The Ten Commandments are fairly rudimentary, and not very global. And some are clearly not appropriate for manifesting themselves in law because they would be coercive, like to honor the Lord thy God. Or anti-blasphemy laws would be completely violative in our very muscular view of the First Amendment and freedom of speech. Then you don’t share the view of many Christian conservatives who want to put them into public buildings? Starr: As part of the ceremonial notation of where our laws come from, it’s appropriate. The Ten Commandments are found in the Supreme Court of the United States, as part of the architecture. But I think one has to be very cautious about introducing overtly religious expressions into public buildings and carving scriptures into stone and so forth. Because we do have an establishment clause in this country, you know, in contrast to many of our European friends and allies, which we believe strengthens religion by keeping the government relatively free from it. But at the same time being able culturally to acknowledge these historical traditions. We don’t need to blind ourselves to our history and tradition, and it can be honored. Do you think that the United States is a Christian nation? Starr: No. It is a nation that has Christianity as its roots. Obviously, virtually all of colonies were founded on the basis of religious devotion and activity and to a great extent religious freedom, although more limited than now. We are a nation of devoted individuals, devoted to religious freedom and freedom of conscience. The majority of whom happen to be Christians. What religious principles do you personally need to compromise when you practice law? Starr: I have not found any. Integrity in the presentation is very important, and therefore being honest with one’s clients. Being respectful of the legal materials themselves. Understanding that the facts have integrity, and therefore guiding the client in light of what the facts are, as best one can understand what the facts are. And so I have not found that law is a calling where I have needed to even consider compromising basic principles. Because the principles of the law are principles that any person of good will should be able to say, I might disagree with the law, but until the law is changed, then that law is that which governs us. You also work in private practice, mostly for big global companies. Capitalism is part of modernism. Modernism is in stark contrast to religion. Starr: Well, I take a different view. I have a much more benign view that’s captured beautifully by Michael Novak, a very thoughtful Catholic observer who has talked about the spirit of capitalism, and Christianity. The late Pope John Paul likewise articulated a vision of human dignity that included the idea of economic activity and work. Scripture again can be somewhat harsh in this respect. One scriptural admonition is that if a person will not work, nor should he or she eat. That work is good, that work is worth and ennobling, and so we should be both eager to work and, parable of the talents, to use our talents. You defend the private military company Blackwater. Isn’t that in contrast to many Christian principles? 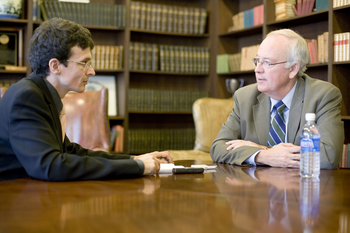 Starr: The particular issue in which I was involved, was a narrow one. It was about where should that lawsuit by the families, the survivors of that horrible episode in Fallujah, be tried? Should it be in state court or should it be in federal court? I felt that I was going in fact exactly the right thing. It’s not that those persons should be denied their day in court, but it should be the best court, the fairest court. I lost. Jesus teaches modesty. Lawyers are among the best-paid professionals in the world. How do you bring that together? Starr: Lawyers tend to be overpaid, and I worry about that. We spend too much time thinking about the bottom line. That is a relatively new phenomenon for the Americana legal profession. Some of the great icons of American law lived, you know, comfortably, but they didn’t become wealthy. One of my criticisms of our profession is that we have moved so strongly in the direction of the billable hour. This has really eroded the tradition of mentoring. And mentoring traditions are very important in terms of conveying a sense of the majesty of the profession and the greatness of the profession. Supreme Court Justices who tend to disagree on issues like abortion and school prayer and the like agree that there is a significant need to reform in very significant ways our civil justice system. You have chosen to become the dean of a law school. If you could work entirely in private practice you could make much more money. Why have you chosen not to do so? Starr: Money has never been the animating force in my life, and I hope it never becomes that. And I’m 61 years old so I’m not likely to pick up that particular habit. Again, Scripture tells us that a person’s life does not consist in the abundance of his possessions. And, you know, naked we came into the world and we go out with absolutely nothing. Starr: Well I guess the best way to put it is that it enables one to do good, and happily, to live comfortably. I certainly do not live as Francis would, an aesthetic life. I’ve not taken a vow of poverty. Perhaps I should. Perhaps my spouse thinks I have. But we haven’t. We live comfortably, but we also try to be as generous as we can be, and to always be at least anxious to be able to say, Hey, how can I help? If it’s not the money, what gets you up in the morning? Starr: I love being with the students, and I love to teach, I love the classroom or the seminar room. And I’ve always reached the stage of life where I love sitting down with students upon their request and giving avuncular advice and guidance in counsel. And then I like the idea of building our institution. We just had a program a week ago on asylum for refugees. We can get you a copy of that program and we’ll give you an example of what a Christian law school would be concerned about. We are concerned about those who are persecuted in other countries, who then hopefully find their way to the United States and they’re seeking refugee status. You surprised a lot of people when you took on death penalty cases a couple of years ago. Was it out of the Christian value of mercy? Starr: Well, I don’t want to take too much credit for that because the case was actually brought into the law firm through the Notre Dame project on Capital Punishment. But once the firm decided to take on the case and then decided that it would be useful for me to be involved I was very eager to be involved. You won in one of the cases where you unearthed a lot of factual problems. Not everyone on death row has a top lawyer like you to defend him. Isn’t this an argument against the death penalty? Starr: It’s really an argument against the current administration of the death penalty. The problem tends to be, and you’ve identified the problem, the lack of adequate representation at the outset. But that can be cured. If we see fit to continue with the death penalty—and I am not an abolitionist, but I’m also not an active proponent of the death penalty. So you want to reform the death penalty to keep it? Starr: I can be very sympathetic with both views. There are certain extreme cases, and there was a recent example here in California of a case involving a prison gang that was responsible for many murders inside prison. And these are individuals who are already suffering life imprisonment. They’ll never see freedom again. But they continue to order murders and the murders have a racial component. Well what does society do? To me there’s a sort of a just war defense for certain extreme cases. But I do think that the death penalty is overused. What have you learned from meeting human beings on death row? Starr: We are all flawed, fallible creatures, who should “in the higher angels of our being”, to quote Lincoln, be willing to forgive. At the same time, we should as sensible members of organized society be eager for our community to take reasonable measures to protect us from truly dangerous individuals who may well seek to kill again. Jesus saved Mary Magdalene and said “He that is without the sin of immorality, go ahead and stone her”. Isn’t that a Christian argument against the death penalty? Starr: That punishment lacked proportionality. She was caught up in adultery and happily we would, given our modern view of proportionality, say that the death penalty should be reserved for only the most serious and heinous kinds of offenses. I do think, again, the death penalty is overused in the United States. You grew up in very Christian family, you memorized Bible verses, and there was no drinking, no smoking and not even dancing. How did this affect you as a person? Starr: It was a wonderful childhood. It was an enormously safe childhood when you think about the problems of family dislocation and so forth. It was an incredibly loving and caring and nurturing family, so, I give thanks daily for my upbringing. I don’t think it hurt me a great deal that I wasn’t smoking and drinking as a young person. Smoking is still very bad for you, but I have picked up the very pleasant hobby of wine and representing the wine industry. So I’ve come to appreciate all the more Our Lord’s first miracle with Cana of Galilee [when Jesus turned water into wine] and I encourage fellow Christians to read that part of Scripture with much greater respect. Young people normally rebel against their parents. Why didn’t you? Starr: I had I would say more of a soft rebellion but not a hard rebellion. I mean, I asked lots of questions about this particular religious practice or that, so I guess I would say I was a very inadequate young Socrates asking questions, and questioning more generally. But no, I never went into a Woodstock-type rebellion. You were 22 years old in 1968. Don’t you regret that you missed out on all the action? Starr: No. I don’t think I have an arrest record, for starters. I think I could have been more assiduously attentive to what was happening in the sixties in terms of the rights of the underprivileged, and especially racial minorities. I wasn’t unsympathetic, but I don’t think I was as active as I could and should have been. You once were on the shortlist to become a Supreme Court justice. What would you have liked about this position? Starr: Serving as a judge was very rewarding. I was privileged to be a judge on the US Court of Appeals for five years, and it was a very satisfying time. I loved the job description of trying to get the right answer, to do the right thing. To, as we were discussing earlier, to really respect the law, to resolved disputes in hopefully a fair and upright manner. And I fell in love with the process of judging when I served as a law clerk, and therefore frankly aspired to be a judge. George H. W. Bush was planning to appoint you to the highest court. Why didn’t it work out? Starr: By God’s grace I was privileged to be a judge for a while. I would have loved remaining a judge, but it was not to be. Being a judge gives one a lot of power. Because of the US common law, judges make law. How does one deal with this responsibility as a judge? Starr: One should be very humble, and here’s another Christian value, which has been articulated with some of the great persons ever to grace the American bench. And that is a sense of humility. Because in the American system judges serve during good behavior, which really means life tenure, they need to listen very respectfully to obviously the lawyers, but also to their brothers and sisters on the bench, and to engage in self doubt. Not to be arrogant, but to be very humble. Give it one’s best, but to be modest about one’s own role and not to be out there to “make law”. As a judge you have a lot of power. What does power mean to you? Starr: Power should be the opportunity to be a servant leader, who is given responsibility. It is a fiduciary responsibility; it is a trust that is given to one. And so, it should be used with great care and great circumspection. Humility is a part of that, but also a lot of self-doubt. The world sees you as a superstar lawyer, as one of the smart legal minds in this country. What do you like to see yourself as? 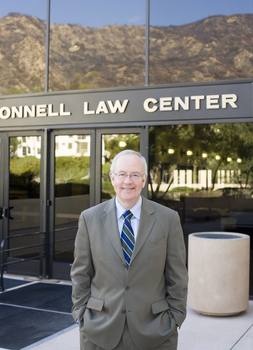 Starr: As a person who really enjoys being in an institution like Pepperdine, and who enjoys being of help. I like to help. It was agreed that we do not talk about your role as an Independent Counsel and the Monica-Lewinsky-Scandal. But let me ask one question. You were under the spotlight of the world media for a long time. It must have been an extremely intense time. How does one leave such a thing behind? Starr: Well, just leaving it behind was very easy to do. I was given a book about –I forget the name of it, I didn’t even read it, it was called Adjusting to the Loss of Power. I said, that I don’t need to read this book. This is a matter of relief, I believe that I’m laying my burdens down, so there’s a great tradition in this country, that I with were a bit more honored these days, which is, you’re called upon to serve and you serve and then you return to private life. General Washington could have been President for Life. Now, he ended up not living long after his presidency, but perhaps he would have lived longer if he had remained president of the United States. But he chose not to, and to return to private life, and I greatly admire that tradition. As Independent Counsel you were under tremendous scrutiny, one half of the country hated you, the other respected you tremendously. How does one re-invent him? Starr: I’m not sure that I did a very good job. I just continued on in my profession. I didn’t go off on some very long sabbatical. I did take off time, but to complete a project that I had undertaken when I first left the Justice Department, the Solicitor General’s office, and that was to do my book on the Supreme Court. I just had never finished the project. So I was able to do that, but I returned to my law firm, and I returned to teaching. So to me it was a restoration of what had been unfolding. So it wasn’t so much reinventing, it was reclaiming what I had been able to do before. Starr: The Independent Counsel experience brought home powerfully the need for structure and accountability in our governmental system of separated powers. The mechanism suffered from a severe design flaw so that, when controversy inevitably erupted, no one in authority was at hand to defend the institution in the vital arena of public opinion. Why haven’t you written a book about your role as an independent counsel? Starr: I’ve been deeply ambivalent about it. Part of me says, you should, and I’ve been encouraged by any number of people to do that. I also have not particularly enjoyed talking about myself, and there would be a certain autobiographical dimension to it. I have spoken about it. Especially shortly afterwards, because I felt that an important part of accountability was to be able to talk about the independent counsel experience. And so I did that for many months, that I would be willing to accept invitations to talk about that. But it also seems to me that now that’s largely a closed chapter in the nations’ history. Ken Star is now going after Proposition 8 in California ? What an absolutely historicaly out of touch retrograde putz! He and Rush need to work up a radio strip act. And the GOP wonders why they are held in low, low, low, low, low regard? This hypocrite is singularly responsible for making it impossible for the President of the United States being unable to do his job effectively, and all because of a trivial heterosexual interlude that’s of such a miniscule import, especially when compared to the dire and lethal lies espoused by Bush and his gang, it boggles the mind. Future generations will have a tough time determining which villain, Boss Tweed or George Bush is more culpable of disastrous genuine corruption. Ken Starr is among the worst of the worst, more comparable to Roy Cohn than Oliver Wendel Holmes. His name is far more contemptible than Richard Nixon, Ulysses Grant, or any of the indefensibly corrupt politicians that have done so much to reduce the prestige and potential for good that out great nation is capable of.